The "New Brunswick Courier" (Saint John) reported on July 3rd, 1852 - "Another very strong and substantial brig called the AUSTRALIA was recently towed down from Quaco, where she was built by Mr. John Brown. She measures 178 tons N.M. and 209 tons O.M. This vessel has been purchased by a company of persons, who are fitting her out for the diggings. She is divided into 64 shares, and has nearly as many owners, and it is probable it will carry out over that number of passengers. There will be a complete second deck laid, which will be fitted up with berths and we have no doubt but that this will be an economical and comfortable manner for those parties proceeding to Australia." The Shipping Register for the Port of Saint John, New Brunswick contain the following entry - "AUSTRALIA No. 79 July, 1852 - Built at St. Martins in the County of Saint John, New Brunswick in the present year 1852 as appears by the certificate of John Brown and Thomas Lamb the builders dated June 28, 1852 here filed." The vessel is described as "One and one half poop deck Two Masts Length 88 feet five tenths her breadth in midships 19 feet six tenths depth in hold at midships 11 feet five tenths. Brig rigged with a standing Bowsprit square sterned carvel built no galleries Billet head". The subscribing owners are listed as:- "Matthew Mawhinney Suffren, watchmaker 32 shares, George H. Cunnabell, carpenter 32 shares". It seems that Suffren and Cunnabell were only nominated as the owners for convenience; as stated in the "New Brunswick Courier" report above, the brig was "purchased by a company of persons ... 64 shares ... nearly as many owners". To date, the only proof found of further named owners is in the August 10th, 1852 Saint John Customs House records - "George H. Cunnabell aforesaid has transferred by Bill of Sale dated 9th inst. to Samuel Shaw, yeoman, one sixty-fourth share; to Charles E. Weldon, yeoman, one sixty-fourth share; to Tamberlane I. Campbell, yeoman, nine sixty fourth shares; to George G. Prince, yeoman, two sixty-fourth shares; to Thomas Whitney, yeoman, one sixty-fourth share and to Horatio N. Arnold, yeoman, one sixty-fourth share, all of Saint John, New Brunswick." However, there are several anecdotal accounts of other passengers having shares in the AUSTRALIA. My father used to tell me about his grandfather, Joel Tompkins (passenger #31), being part-owner of the ship which brought him to Australia. On arrival, the ship was sold and "they all sat on the steps of the bank and divided the proceeds". In a short biography of William Hallad Davis (passenger #33) published in "Victoria and Its Metropolis: Past and Present" it states "He arrived in Victoria in 1852 by his own brig Australia, which was sold for 500 pounds". Tamberlane J. Campbell (passenger #62), his family and the Cunnabells went to New Zealand within a month of arrival and a 1953 newspaper article celebrating the centenary of their New Zealand sojourn states that "...in the early 1850s a small adventurous group captained by Tamberlane Joseph Campbell built their own ship and set sail for Melbourne. The name of the ship has been forgotten.... They arrived in Melbourne late in 1852. Some of the party were dropped in Australia while the rest sailed on for New Zealand". Further, the obituary for Robert Hazen (passenger #51) in the "Yarrawonga Mercury" (Victoria, Australia) of Nov. 30th, 1893 states that "Mr Hazen came to the colony in l852 or 1853 .... about forty or fifty young men of the neighborhood of Fredericston (sic) combined and purchased a vessel, equipped and manned her, and set sail for Australia ... They touched in at the Cape on the voyage out, took in a cargo of gin, which they brought to the colonies and disposed of at such profit as to enable them to defray all the expenses of the voyage ... The vessel was known as the "Brig Australia"". The only known official list of persons on the maiden voyage of the AUSTRALIA is the un-dated 3-page passenger list which was prepared before the brig sailed. This list was accepted by the authorities at the end of the voyage and the original is kept by the Victorian Public Records Office in Melbourne, Australia. All efforts to date to locate a list of crew members on the brig have failed. So we cannot even be sure that everyone on the passenger list actually made the trip out, nor can we know if anyone else "caught the boat" at the last minute and was not recorded! Similarly, we have no official record of any births or deaths on board. But passenger #68, Alfred Campell aged 1, is supposed to have died en route to Australia. And it is certain that at least one baby was born during the voyage. Passenger #72, Isabella Seelye, was the wife of the AUSTRALIA's master, David Seelye (photo at right courtesy of John F. Seelye and Keith S. McKechnie), and the published genealogy of the Seelye family lists their son Norman as being born on November 2nd, 1852. When this baby died in 1854, the death record shows that he was born "at sea" and was 2 years old. The AUSTRALIA was cleared to sail on August 7th, 1852 but departure was delayed until the following week. The "New Brunswick Courier" reported in its Saturday, August 14th issue:- "The brig Australia having on board about 70 passengers, the greater portion of them being young men, natives of this city and its vicinity, was towed out of the harbour by the steamer COMMODORE on Wednesday evening and sailed for the goal of her passengers' hopes and expectations on the following morning. From the fact that this vessel containing so many individuals connected with the City and Province, and many of them having a pecuniary interest in her, more than ordinary anxiety is felt for the success of the venture, and in common with others, we wish the good ship AUSTRALIA a speedy and prosperous voyage to the region from which she derives her name". So the departure date was Thursday, August 12th, 1852. The following table sums up the research to date about the persons who are designated on the official passenger list cited above. The first column shows in alphabetical order each family group or individual with all details which were shown on the original list (added material is in italics). The second column lists entries found in available copies of the 1851 New Brunswick Census which seem to refer the persons in column one. Regrettably, the St. John County Census records are incomplete. In the final column you'll find information about the probable movements of individuals after arrival, based largely on the Victorian Birth, Marriage and Death Indexes on CD-ROM. Full certificates have had to be obtained to identify some individuals. In several cases, descendants of passengers have been located and much information is now available for particular families. With the release in 2005 by the Victorian Public Records Office of online records of outbound passengers from Victoria (1852-1861), it's been possible to identify several persons - who were probably brig passengers - leaving Australia; details are shown in green in column 3. And thanks to the LDS FamilySearch 1881 Canadian Census site it's been possible to locate records of several passengers who obviously returned home from Australia. Also, from various other census records and other sources, information has come to hand about the activities overseas of other passengers who had obviously left Australia. Details are also shown in green in column 3. Clickable links have been provided to contact researchers where permission has been gained for their inclusion. More links will be added as approval is received; for the present, click here for information on reaching anyone without their own link. Available photos of passengers and/or their graves are indicated by the clickable camera icon appearing in column 3.
to Australia from the US and Canada during the gold-rush years. Click on the icon for further details. Alexander, William, 49, Scot. Bachelor, Farmer:Prop., 23 June 1832 Nothing definite found. Arnold, Charlotte A., 12, dau. Lemon, Sarah, 18, servant, Irish, 1849. An item in the "New Brunswick Courier" dated July 23rd, 1853 tells of the death from fever in Melbourne on 20th Feb.,1853 of Horatio Nelson Arnold, third son of the late Rev. H.N. Arnold of Sussex, Kings County, aged 19. This Arnold family was related to the Cunnabell and Mailman passengers through the Eaton line. The Rev. H.N. 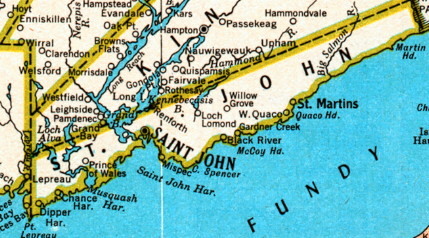 Arnold's connection is detailed in "The Nova Scotia Eatons". N.B. The correct surname should be Atchinson. N.B. See next column for link to this family. William Atchison (sic), passenger #71 was shown as a Master Mariner, and the family group in col. 2 included probably his mother and mother-in-law (Ann Richardson). Ann Atchinson was shown as "Wife" but no husband was listed; presumably he was away "at sea" when the census was taken. Marriage records show that William Atchinson and Ann Ramsey Grant married on Dec. 2nd, 1829; the "New Brunswick Courier" listed the groom as Capt. William Atchinson of the brig "Harriet" - almost certainly the same Master Mariner. As no record has been found in Australian records for Atchinson, it's fairly safe to assume that he returned home to his family after this voyage. plus 4 lodgers. A David Baker, a widower, married Catherine Robinson in April, 1853 in Geelong; then in 1857, David and Kath Robertson (sic) Baker had a child named Iden at Duneed in the Geelong area. In view of the following details, the above David Baker is almost certainly not the one who was on board the AUSTRALIA. In the 1881 Lepreau, Charlotte Co., N.B. census is David Baker aged 50, born in the USA, occupation "Filer in Sawmill". In the same house is Jane Baker aged 86, also b. USA. And a Thomas Baker aged 43, a "Mill Filer" can be found in the 1881 Newcastle, Northumberland Co., N.B. census with five other Bakers. Barbarie, Oliver, 56, husband, farmer, French, Loy. Desc. ** This Oliver is not passenger #30. Courtland Barburie (sic) had a son Oliver in 1861 and a daughter Gertrude Minnie Barberie (sic) in 1863 - the mother of both is listed as Selina Walker. And Courtland Barberie (sic) married a Selina Guerzella in 1863! Courtland Barberry (sic) died in 1863 aged 32, his father listed as Oliver and his mother as Susanah Leonard. Selina Barberie, age 90, died in N.S.W. in 1928 and her father's surname was listed as Walker. "The John Robert Barberie Family Home Page". of John and Mary Anne (Arnold) Barberie. Oliver Barberie, aged 30 sailed on the RED JACKET in Dec., 1858 bound for Liverpool. Oliver D. Barberie, aged 52, is listed in the 1881 census - Ward No. 4, Portland, Saint John, N.B. with his wife and two children. Oliver's occupation is shown as "Seafairing". #76 - Belmain, John, 25, Cordwainer No census record found. "The History of Queens County" by E. Stone Wiggins (1876) includes mention of the Balmaine (sic) family settling at Grand Lake, Queens Co., New Brunswick. One passage reads "Charles and John, sons of John Balmaine, went to Australia on the brig "Australia" where the latter still lives. Charles died, when returning to New Brunswick from California". To date however no record of John marrying or having children has been located. Two Belmain men, Charles and John, aged 28 and 25, sailed on the JAMES BAINES in March, 1855 bound for Liverpool. If the Wiggins book quote above is correct, then presumably John returned to Australia at some point. Inward shipping indexes show a John Balmain (sic) aged 27 arriving in Victoria in Oct., 1857 (from a British port). Berryman, Daniel, 5, son. When I first saw 50 year-old John Berryman in the 1881 Queens Ward, Saint John, N.B. census with his occupation listed as "# Doctor" (sic) I doubted that he was the "right" one. However, on the previous census page, just three houses away, I found Maria (sic) aged 77, Campbell G. aged 41 and a David E. aged 34, an "M. Doctor" (sic). This last person may well be the same as the 5 year-old Daniel from col. 2. John Berryman's obituaries dispel any remaining doubts! Berryman family in New Brunswick. #50 - Bond, John, 22, Joiner No census record found. A John Bond, a mason aged 21, born in Truro, Cornwall, married Martha Elizabeth Bedggood in October, 1854 in Melbourne, Victoria. The same year they had a son at Geelong, Victoria who died at one day old. Martha died in 1881 at Benalla, Victoria aged 45. Holly, Shadrack , 78, wife's father [came] Oct 1783 John Ambrose Brown, aged 29, born in New Brunswick, married Isabella Smith Matthews in August, 1862; his parents were shown as John Savage Brown and Mary Holly. John and Isabella had six children up to 1878, of which, three died. John Ambrose Brown died in Oct., 1903 aged 72 at Hindmarsh, South Australia and is buried there. Ward Brown died in Oct., 1892 in Mudgee, N.S.W. aged 60, his parents named as John Brown and Mary Holly. The death record indicates that he was not married. Another brother, George Edgar, also came to Australia and married Jane Laurence Carige in 1870. George died in Yarrawonga, Victoria in 1894 aged 61, his parents named as John Savage Brown and Mary Robinson Holly. Researchers: Shirley Bulley and Judith Douthie. N.B. It is believed that Alfred died during the voyage. No census record found. The Campbells, Cunnabells and Mailmans were all related and went to New Zealand. Elizabeth's maiden name was Cunnabell and she was a sister of George Hunt Cunnabell, passenger #13. The Campbell family is well documented and today there are numerous descendants in New Zealand and overseas. (but Henry and William were brothers). for William has been discounted. A 1963 history titled "Wangaratta" by D.M. Whittaker states that Henry Charlton "born St. Johns, (sic) New Brunswick" was a "sawmiller and rough carpenter, bridge and road contractor" who "died Wangaratta 1902 aged 79". Henry Charlton married Martha Hussey in 1859 and they had a large family, all born in Wangaratta, Victoria. The Victorian 1902 death index lists his parents as Augustus and Lena Charlton (refer obituary). William Charlton left Australia and returned to New Brunswick where he married and died in 1899. William Charlton is listed as a 53 year-old "Farmer" born in N.B. with his wife Maria and one daughter in the 1881 Springfield, Kings Co., N.B. census. #15 - Cunnabell, Lorenna, 16 No census record found. The Cunnabells, Campbells and Mailmans were all related and went to New Zealand. Eunice's maiden name was Eaton and she was a sister to Mary Paulina Mailman, passenger #6. George was a brother to passenger #63, Elizabeth Alexandra (Cunnabell) Campbell. The Cunnabell family is well documented in New Zealand and overseas. Researchers: John and Frances Parnell. Cartmeal, John, 79, Eng., Lodger:Pauper:Infirm, 1800. A David Currie and Margaret Shand had two daughters in the Forest Creek/Castlemaine area in 1858 and 1861.In view of the following details, the above David Currie is almost certainly not the one who was on board the AUSTRALIA. The 1881 Drummond, Victoria Co., N.B. census includes 57 year-old David Curry (sic) "Farmer" and 54 year-old Fesby (sic) plus three children. The parents here are surely the David and Phebe from the 1851 census in col. 2. #36 - Curry, George W., 26, Tanner No census record found. A George Currie, a storekeeper aged 31, born in Scotland, married Harriett Frances Glascott in September,1856; his parents are shown as William Currie and Henriette Lay/Lang. George and Harriett had six children between 1857 and 1875. In view of the following details, the above George Currie is almost certainly not the one who was on board the AUSTRALIA. George W. Currie (sic) is listed as a 56 year-old "Farmer" born in N.B. with four other Curries in the 1881 Wicklow, Carleton Co., N.B. census. #49 - Davis, John, 28, Ship's Carpenter. John Davis, 27, Lodger, Ship Carpenter. (All listed as being born in New Brunswick) Nothing definite found. N.B. A 10 month old infant is shown on the same line as Maria - neither passenger number nor name is shown. Borwell, Faith, 60, widow, England, 1849. William Hallad Davis and his wife Maria Boswell lived in the Bendigo, Victoria area and had four children 1853-1858 - all four had died by 1860. However, the un-numbered and un-named infant on the passenger list was certainly Lavinia Davis. In 1871, she married William Henry Beresford and the marriage index shows her as being born in St. Johns (sic). The Beresfords had seven children between 1872 and 1888. Lavinia died in 1924 aged 73 - therefore born 1851; her parents are listed as Wm. Halad (sic) Davis and Maria Boswell. William died in 1895 aged 89 and Maria died in 1901 aged 84. N.B. The correct spelling is Dockendorff. (b. N.B.) is listed in the house of Francis Hebbert(?) and family. Duckindorf, (sic) Jane, 40, widow, b. N.B. Duckindorf, (sic) Hiram, 19, son, b. N.B. Duckindorf, (sic) Susan, 10, daughter, b. N.B. Note: Christopher's parents were William Dockendorff and Jane Ash who married in Charlotte County on June 3, 1824. Christopher Dockendorff, a storekeeper aged 30, stated that he was born in Bangor, Maine when he married Kate O'Brien in Vic. in June, 1863. They had a son Hiram Dockendorff at Wangaratta, Victoria in 1870. However, in 1869, Christopher Dockendorff and a Matilda White had a daughter Florence who was born in Collingwood and died in Fitzroy (both inner suburbs of Melbourne) the same year. Christopher (known as Christie) and Kate had other children but the birth records have not been located; Chris Dockindorf (sic) died aged 54 at Kew, Victoria in 1887. Kate died at Wangaratta in 1918 aged 83. Stevenson, Armstrong, nephew, 12 An Armstrong Elliott, aged 25, sailed on the ROXBURGH CASTLE in April, 1857 bound for London. Also on board was a John McLeod, possibly brig passenger #60. An Armstrong Elliot, aged 56 and born in N.B., "Enginer" (sic), is listed in the 1881 census with two female Elliots (possibly his wife and daughter) in Prince Ward, Saint John, N.B. plus 7 lodgers and 3 servants. Nothing definite found. Hanson, Bridget, 17, servant, Irish, 1846. A Thomas Everett and Jane Mearns had five children between 1866 and 1872 in the goldfields area. In view of the following details, the above Thomas Everett is almost certainly not the one who was on board the AUSTRALIA. In the 1881 census for Ward No. 5, Halifax, Nova Scotia, Thomas E. Everett, "Hat and Fur Maker" aged 48 is listed with three family members. Also, in Prince Ward, Saint John, N.B., his father, Charles D. aged 78, and brothers Edwin J. aged 44, George F. aged 51 and Henry L. - a "Hatter" - aged 38 are all recorded. Fenton, Catherine, 12, dau. Native This family is well documented in Victorian records. The daughter Elizabeth married John Suffren, a brother of passenger #10, Matthew M. Suffren. John Fenton and Alexander left Australia at some point as they are listed as returning to Melbourne on the QUEEN OF BEAUTY from Liverpool in Dec., 1864 with John Jr., his wife (un-named) and three daughters. John Sr. died aged 81 in 1882, Catherine died in 1882 aged 76 and Alexander died aged 50 in 1881, all in Warrnambool, Victoria. #47 - Hanson, Peter, 32, Ship's Carpenter No census record found. A Knud Peter Hanson, a carrier aged 28, born in Denmark, married Sarah Pike in 1855 and they had seven children during the next 12 years. Charles Hazen, husband, 56, Farmer, JP, Prop.
. Robert Hazen married Mary Ann Rawlings in 1856 and they had eight children during the next 18 years. The first three were born at Maryborough but the others were born in suburbs close to Melbourne. Robert died at Yarrawonga, Victoria in Nov., 1893 (refer obituary). Walter E. Hazen and Janice White. Holmes, Jane, 20, dau. Nothing definite found. #73 - Kelly, Miss, 23 No census record found. Nothing definite found. Magee, Jane, 39, wife, native. Summerfield, Ann, 16 This family is well documented is the Victorian records. Thomas Magee died in 1859 aged 57 - he's shown as a son of John and Margaret (Graham) Magee, born IRE. Jane died in 1902 aged 90, dau. of John and Jane Kenallen (sic). Sarah Grace m. William Henry Bateman in 1853 and they had 11 children over the next 20 years. (Previously shown information that Sarah had m. Charles Mill in 1862 was incorrect). Hester Eustace Magee m. James Dallimore (both b. New Brunswick) in 1870; they had six children. Anna Augusta (b. New Brunswick) m. Robert Joseph Tymms in 1870 and they had eight children. She died in 1938 aged 89 and her parents are listed as Thomas and Jane (Knollin) Magee. Young Thomas was the Thomas Sancton Magee (b. Newfoundland) who m. Jessie Brown Morrison in 1873; they had ten children by 1886. Researchers: John Simmons and Sue Tymms.
. The Mailmans, Campbells and Cunnabells were all related and went to Wanganui, New Zealand. Mary's maiden name was Eaton and she was a sister to Eunice Cunnabell, passenger #14. Mary's husband John mailman is not listed but was probably a crew member of the "Australia". A New Brunswick newspaper reports that John and Mary married on Aug. 1st, 1852 "on the eve of their departure for Australia". In Victoria, John and Mary had a three month old daughter who died in 1854, but no record has been found of the child's birth. Their daughter Emma Augusta was born the following year (the family name was listed as MAITMAN). John is shown as being a Shipwright aged 40, born in New Brunswick. Mary is shown as being aged 24, born Nova Scotia. Emma's birth certificate confirms that John and Mary married in 1852 in New Brunswick. The three children with Mary on the passenger list were John's children from his previous marriage to Mary's sister, Eliza Irene Eaton. John died in 1892 aged 78 and Mary died aged 77 in 1907, both in New Zealand. Their death certificates indicate that they had been in N.Z. since approx. 1856. Refer to "The Nova Scotia Eatons" on the Internet. McCurdy, Margaret, 80, [Mother? ], Scot., 1833. A book entitled "John McLeod Ship Building Company, Black River, N.B." by Mary Bedford tells of Peter McLeod, a shipwright, born in Greenock on the Clyde, immigrating to New Brunswick, finally settling in Black River where he died in 1865. His son "John born 1826 devoted his energies to fishing and lumbering while living on his father's farm. In 1852, he went to Halifax, NS to embark on a voyage to Australia. He spent five successful years in the gold mines of Australia. Returning home in 1857, John built the the ship "Brilliant" which he sailed for four years, as Master......". He then gave up seafaring and turned to shipbuilding (with over two dozen ships to his credit) until his death in 1901. He also held a number of public offices including being an MP for the Black River area from 1892-1899. John married in 1869 to Mary Ann Aylward, but they had no children. A John McLeod,, aged 30, sailed on the ROXBURGH CASTLE in April, 1857 bound for London. Also on board was an Armstrong Elliott, possibly brig passenger #69. John and Mary A. McLeod, aged 53 and 35 respectively, are recorded in the 1881 Simonds, Saint John, N.B. census - John shown as a "Ship Builder". #48 - Menzies, Robert, 29 No census record found. A Robert Menzies, a seaman but "presently a miner" aged 23, born Port Glasgow, Renfrewshire, married Elizabeth Band in 1855 and they had ten children up to 1874, all born in Ballarat. Doherty, Thomas, 7, grandson Edward Moore married Annie Kells in Victoria in 1869. He died at Dandenong, Victoria in 1890 aged 62, his parents shown as Andrew and Sarah (Gibson) Moore. Edward and his parents were natives of Co. Fermanaugh, Northern Ireland according to a Moore Genealogy on the Internet. #58 - Nealey, Benton, 20, Blacksmith No census record found. No record has been found of his time in Australia. A Burton Neilly, age shown as 19, sailed on the SWIFTSURE in April, 1857 bound for London. N.B. The "New Brunswick Courier" reported that on 16 Oct., 1843 Robert Vores (sic) Neily of Nictaux, Nova Scotia married Leah, daughter of the late Richard Burchill of Bandon, Co. Cork, Ireland. And cemetery records in Nictaux, N.S. indicate that Robert V. Neily died on 17 Aug., 1850 (should be 1851) aged 37. Leah Neily was a widow when she came to Australia and she remarried on 24 May, 1853 to Edward Edwin Blythe in Hobart, Tasmania. Leah died at Alma, South Aust. in Oct., 1875. Her son Richard Burchell (sic) Neily married Jessie Greenshields at Riverton, Sth. Aust. in 1868. Richard died at Berri, Sth. Aust. in 1929 aged 83. Sarah Clarke Neily, of full age, born St.John, New Brunswick, daughter of Robert Vorous (sic) Neily and Leah Burchill, married James Friend Kibble (who was born in Tasmania) in December,1868. N.B. Janice White of Montreal advises that this passenger's full name was George Gilbert Dixon Prince, son of George Fox Prince and Ann (Bostwick) Prince. He was a first cousin to passenger #59, John Daniel Prince. Correspondence (in the New Brunswick Museum) from passenger #43, James William Robertson, indicates that George Prince was in New Zealand in 1871 and was planning to return to New Brunswick later that year. The Saint John, New Brunswick "Daily Telegraph" on November 19, 1873 reports the death "at sea on ship "Yorkshire" bound from Melbourne to London about the middle of September, (of) George Gilbert Prince, age 43, native of New Brunswick and for last 21 years a resident of Australia". Cabel, Mary Anne, b.US, (came to NB) 1783 John Prince, a miner aged 25, born at Saint John, New Brunswick, son of Elias Prince and Jane ?Kable, married Jane Walsh in Victoria in 1857 and they had 4 children by 1864 (he is listed as John Daniel on birth records for two of the children). Purvis, William, 39, no status stated, clerk, Scot., 1823. A William Purvis and Margaret Croft had 7 children between 1855 and 1868, all in the Ballarat area. Margaret died in 1882 aged 52. #45 - Quigley, Hugh, 22, Millman No census record found. Records show an Edward Quigley as being the son of a Hugh and Ann Quigley. However, information found in Tasmanian records suggests that the abovementioned Hugh Quigley was probably already here before Dec., 1852 and would therefor not be the one who was on board the AUSTRALIA. A Hugh Quigley, aged 29, sailed on the MILWAUKEE in Dec., 1858 bound for San Francisco. #84 - Rickards, Alex, 29, Boat Builder No census record found. Nothing definite found. N.B. Surname should be Robertson. Nothing found. This man's surname was actually Robertson. He spent some time in Victoria before going to New Zealand where he married and had a family. Active in public life, he was the first Mayor of Queenstown, dying in Jan., 1876 aged 50. His obituary in the Wakatip Mail states that he was born at Smithtown, King's County, New Brunswick, son of John C. Robertson. ************************ We previously incorrectly listed the following people as the family of passenger #77. However, William Sr. above and George Sr. below were brothers and George Fenwick Scoullar listed below, who we originally thought was passenger #77, was in fact his cousin. Scoullar, Robert Bruce, 3, son George Frederick Scoullar married Mary Ann Kerch in 1862 and they had three children by 1867, all at Pleasant Creek (now Stawell). Mary Ann died at Stawell in 1887 aged 49 and George died in 1900 aged 66 in Prahran, a Melbourne suburb. We have been advised that George's younger brother, Hiram Nathaniel, preceded George to Australia, arriving here in October, 1852 on board the CHEBUCTO - on the passenger list in the Victorian PRO he is shown as "H.N. Scouter". Hiram married Mary Ann McDaniel, also in 1862, and they had ten children in the Pleasant Creek/Stawell and Avoca area over the next twenty years. Scoullar family records show that cousins Henry Partelow, James Edward and George Fenwick also came to Australia. George Fenwick it seems moved on to New Zealand but Henry Partelow and James Edward both died in Stawell, in 1901 and 1919 respectively. N.B. The correct spelling is SEELYE. During the voyage, on November 2nd,1852, Mrs. Seelye gave birth to a son, Norman. No census record found. This family, including the captain of the "Australia" (surname correctly spelled Seelye), settled in Williamstown on Melbourne's seafront and several more children were born. Capt. David Seelye drowned near Warrnambool, Victoria in 1864 (aged 48) during a salvage attempt. Mrs. Seelye was born Isabella McPherson Cassilis, dau. of Rev. John O. Cassilis and Mary McPherson; she died in 1865 aged 43. Descendants in Australia and New Zealand are numerous. The previously quoted "David Seelye Family" web-site is currently off-line. A photo of Capt. David Seelye appears towards the top of this website. The "New Brunswick Courier" for October 21st, 1843 reports the marriage at St. Patricks (Charlotte Co.) on the 12th inst., by Rev. McLean of Capt. David Seely (sic) of ship "Syrinx" to Isabella Cassilis, daughter of Rev. John Cassilis. Our Cassilis researcher, Joan Kidwiler, has sadly passed away. No census record found. Nothing definite found. Sherred, Isaac, 27, N.B., Brother, Farmer. Isaac Sherrard died in Victoria in 1853 at age 30. N.B. See next column for link to this family. A web-site titled "Descendants of Charles Dixon and Susanah Coates" lists a Rufus Smith who "died in Australia" as a son of Charles Dixon Smith (1794-1887) and Mary Elizabeth Wilson (1798-1862); eight other children are listed incl. the four shown in the previous column. #12 - Suffren, George, 9 months. Sufferen, Elizabeth, 23, wife, native Matthew's middle name was Mawhinney, which was his mother's maiden name. The Suffren family is well documented in Victorian records - they were joined later by Matthew's brother John (b. St. John, NB) who married Elizabeth Fenton (#4 on the passenger list). The August 17th, 1850 issue of the "New Brunswick Courier" reports that on the previous Wednesday, the marriage took place between Matthew M. Suffrin (sic) of St. John city and Elizabeth Weldon, eldest daughter of C. Weldon of Portland parish. Sullivan, Johnston, 2, son. No record has been found of James' death but Martha (nee Dickson) died at Richmond, Victoria in 1884 aged 66. Their daughter Elizabeth Dickson Sullivan never married and died in 1887 aged 41, also in Richmond. Johnston Sullivan born St. Johns (sic) m. Jessie Lennox in 1874 and they had five children (four born in Richmond and one in Sydney, N.S.W.) by 1887. Johnston died aged 43 in 1892, also at Richmond, his parents shown as James Sullivan and Martha Dickson. Young, Joel, 82, Grandfather. Joel Smith Tompkins (my ancestor) helped establish, then settled in, the gold-fields town of Beaufort, Victoria. He married twice and died at Beaufort in 1904. Click here to read JST's obituary. N.B. Less than two weeks before sailing, Joel Tompkins wrote to his sister Magdalene, giving details of some of the preparations for the voyage. Click here to read a transcript of part of that letter. #82 - Trott, William, 24 No census record found. A William Trott and Sarah Jane Hulbert-Turner had eight children between 1858 and 1872, mostly in the inner-suburban area of Melbourne. #55 - Van (or Vair), Hugh, 25 No census record found. Nothing definite found. We have now obtained the death certificate for a James Watson who died in Victoria in 1888 aged 63, son of Henry Watson and Elizabeth College. Unfortunately, the other information contained therein is insufficient to prove whether this person was passenger #19 or not. Marriage indexes show that a James Watson and Margaret Theresa Ryan married in 1859 in Victoria. However, with the help of a direct descendant of the above James and Margaret Watson - Lorraine (Watson) Norrish <rainie45@aapt.net.au> in Western Australia - it's been established that this James Watson was almost certainly not passenger #19. No record has been found of Charles' time in Australia. However he may have been related to passenger #11, Elizabeth Suffren, whose maiden name was Weldon. Joy Timbrel, Lois Nicholson and David Weldon. Whitney, Catherine, dau., 11, NB Nothing definite found. Yerxa, Benjamin, Husband, 49, Native, Farmer/Prop. Saunders, Mary, F, Servant, 17, African No record has been found of Daniel's time in Australia. As an aside, a Chesty Yerxa aged 25 (probably Daniel's brother Chesley) arrived in Victoria, Australia in Feb., 1858 on board the SHOOTING STAR. Chesley and Daniel Yerxa, aged 27 and 25, sailed on the ZONE in Oct., 1858 bound for Port Curtis (?). The total number of passengers shown at the bottom of the list is "69 Adults, 17 children, 3 infants"; this tallies with the 88 numbered passengers and the unnamed and unnumbered child of William and Maria Davis. As stated earlier, no list of crew members has been found, but obviously there had to be others on board to "run the ship". To date, aside from Capt. David Seelye, only three extra names have emerged - the ship's surgeon Dr. William Craig and John W. Squires - both listed in New Brunswick newspaper reports as being on the maiden voyage - and Norman Seelye, born during the voyage in November, 1852 . In fact, the report of Squires' participation consists largely of a letter he wrote home on February 12th, 1853. It is the most complete account of the voyage currently available. In part, it reads as follows - "We arrived on the 28th December, in 45 days from the Cape of Good Hope. We were 84 days to there and lay there 9 days, making 138 days from St. John. We had a good captain, mate, and crew, with an agreeable company of passengers, numbering 106 in the whole. We had very fine weather to the Cape. Passed close to the Azores and Cape de Verd Islands, but did not stop; the only land we made being the Island of Trinadad (sic), a lonely barren spot, without inhabitants...". This was not the Trinidad most people know, but Trinidade in the Atlantic about 700 miles off the coast of Brazil close to the Tropic of Capricorn; another small island, Martin Vaz, is nearby. Assuming that Squires counted correctly, we now have 106 souls on board, but have names for only 94 (incl. John Mailman). It's possible that some of the AUSTRALIA's crew may have transferred to the BELLE CREOLE, which took the Campbells and Cunnabells to New Zealand in January, 1853. The results of ongoing enquiries into this possibility will be added to this web-site in due course. "SATURDAY, 8th JANUARY. To Grocers, Country Storekeepers, and Others. Surplus Stores of the Brig Australian. At the Queen's Wharf. SYMONS & PERRY, Will sell by auction, at the Queen's Wharf, on THIS DAY, 8th INST, Immediately after the Sale of the Vessel, A QUANTITY of Surplus Stores ex Australian, consisting of - Beef, bread, fish, vinegar, pork, pease, &c. A lot of pine boards, planks, English Casks, &c. Extra cabin furniture, cooking utensils, chronometer, marine clocks, lamps, &c. Spare spars and top masts. Terms - Cash. ------------------------------------------------------------------------------------------- SATURDAY, 8th JANUARY. To Speculaters, Lightermen, and Others. Positive Sale of the Splendid Brig Australian, 187 tons, N M, - SYMONS & PERRY Have received instructions from the owners, to submit to public competition, on the Queen's Wharf, on THIS DAY, 8th INST, At Twelve o'clock, Without any Reserve, The Splendid coppered and copper fastened A1 Brig Australian, 187 tons, new measurement, well found with rope, spars, rigging, sails, &c. Sails remarkably fast, and carries a large cargo with an easy draught of water, only five months of having just arrived from St. John's, N.B, where she was built expressly for the owners. Terms - half cash, remainder at Three and Four months. NB No reserve, a first-rate opportunity for investing spare capital". Presumably the AUSTRALIA was sold successfully and everyone received their share! According to "Shipping Arrivals and Departures, Victorian Ports, Vol. 2, 1846-1855" by M.A. Syme (1987), she continued sailing in local waters with Capt. Seelye in charge until October,1853. Several other trips are listed under Captains Spence, Atlee or Eager with the last entry showing that she left for Mauritius in March, 1855 and arrived there in May. The final voyage of the AUSTRALIA is detailed in "New Zealand Shipwrecks" by C.W.N. Ingram - "On arrival at Lyttelton on May 27, 1873, Captain Rogers, of the brig "Scotsman", reported the foundering of the brig "Australia". On May 23, the "Scotsman" passed Cape Campbell in company with the "Australia", the wind blowing with gale force from the north-west. Late in the afternoon the wind fell light, then suddenly veered to the south-west and increased to a terrific gale. On board the "Scotsman" sail was shortened, but it was found necessary to bear up for Cook Strait, running in company with the "Australia", which had every sail flying. At 7 p.m. the "Scotsman" continued to run before the gale, Cape Campbell then bearing north-west, and at this time a green light was seen passing about a mile inside of the "Scotsman", and was believed to be the starboard light of the "Australia". Later, the gale abated, and the wind fell to a dead calm, and the "Scotsman" again rounded Cape Campbell. On the following morning a seaman aloft reported something floating on the lee bow, and two hours later it was seen to be the wreck of a ship. On inspection the wrecked vessel proved to be the brig "Australia". There was no trace of the crew, and the crew [of the "Scotsman"] having salvaged the wrecked vessel's mainmast, the "Scotsman" proceeded on her voyage. The "Australia", which was bound for Timaru with coal, probably struck on the reef near Cape Campbell, the wreck being later found a mile and a half north of the lighthouse. The "Australia", No. 30,407, was a brig of 162 tons register, built at St. Martins, New Brunswick, in 1852. She was under the command of Captain Francis Grey, and is believed to have carried a crew of eight, all told." Thanks are extended to the many people who have assisted with information and referrals to compile the above material. Initially, R. Wallace Hale, the erudite commandant at FORT HAVOC (repository of all that it good in New Brunswick historical material) "came on board" and did the bulk of the census research and list preparation. And it was Gail Durant (with her interest in the ships of St. Martins) who inspired this web-site. Suzanne Lisson and Janice White have assisted greatly with research for a number of families, several right outside the scope of their own interests. Additionally, I must thank Ann Facey, Peter and Denise Wells, Bob and Collen Pounsford, Judy Milne, the late Daniel Johnson, Mark Bryant at UNB, Anne Brown, Judith Douthie, Shirley Bulley, Susan Hill, Kaye Patterson, Miss Agnes Dockendorff, Anna Dockendorff, Helen and the late Gerald Weekes & family, John and Frances Parnell, Marlene Gunn, Ray Hazen, Walter E. Hazen, John Simmons, Sue Tymms, Frances and John Towerton Judge, Lisa Rasmussen, Keith Berry, Chantel Neily, Wayne Neily, Gabrielle Charlton, Rhonda Scoullar, Marie Dickson, Marion Cadogan-Cowper, John F. Seelye, Keith S. McKechnie, the late Joan Kidwiler, Cheryl Condon, John B. Suffren, Harry MacDonald, Joy Timbrel, Lois Nicholson, David Weldon and my wife, Liz, and our family for their support. (a great-grandson of Joel Tompkins - passenger #31). Webpage launched August 31st, 2001. This is update number thirty-eight - August 14th, 2008. Material is added to this site as it becomes available - please call back!